MAADI (Mobile Application Development India) is no where than here to get you with the clone app for Android / iPhones that imparts a very definite purpose for a brief niche that you aspire to succour. We get you with the similar clone app as Kik and customize uniquely as per your requirements that will be compatible with different mobile systems. We have overwhelmed the mobile application world. And when comes to clone apps, our clone app developers bring you exactly an app like kik with additional features like auto-destruction. The clone apps are jam-packed with new and advanced features that can be customized further on demand. 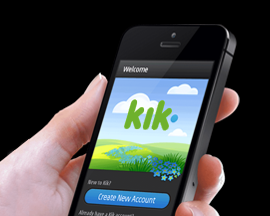 What is the time span to required to build Kik App clone? What are the quirks for the kik clone? The main specification must be communication and the quirk is to connect easily within no time. And even you can add a feature of not sharing contact number or emails to anyone. And this may be the reason to develop the most famous Mobile messaging app kik. Its not just an app cloning, all you need is to re-create a meaningful app. It authorizes the current source code to benefit different alcoves with different layouts. Take an example, you can recreate the Yik-Yak to have your own community of Fitness and Health Professionals who communicates via social messaging. You can add In-App Purchases like cloud storage, feature Unlock, stickers and other features. You can leverage your apps by advertisements, similar to google. Moreover, you can also add the feature to buy Remove ads as an in-app purchase, if the users are intended to use the ad-free messaging experience. The coolest concealed secret is that you can send/text the logo to your friends that helps to promote your brand and also a cool little privacy you can use with your friends to hide your text.